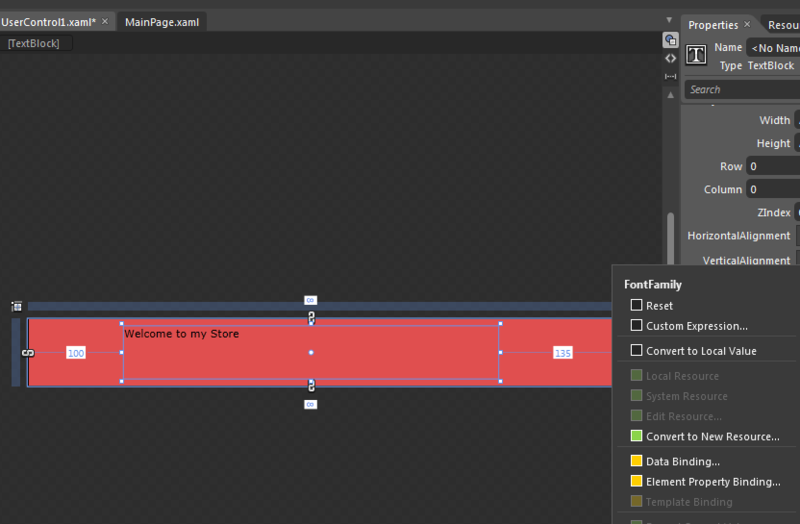 In this section we will see how we can break our pages into small pieces by the use of User Controls. 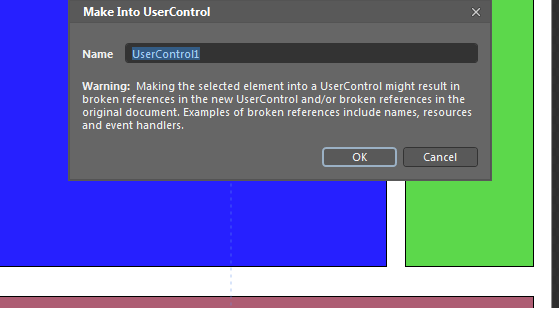 If you have worked even once on Silverlight you will see that UserControl is the root Element. 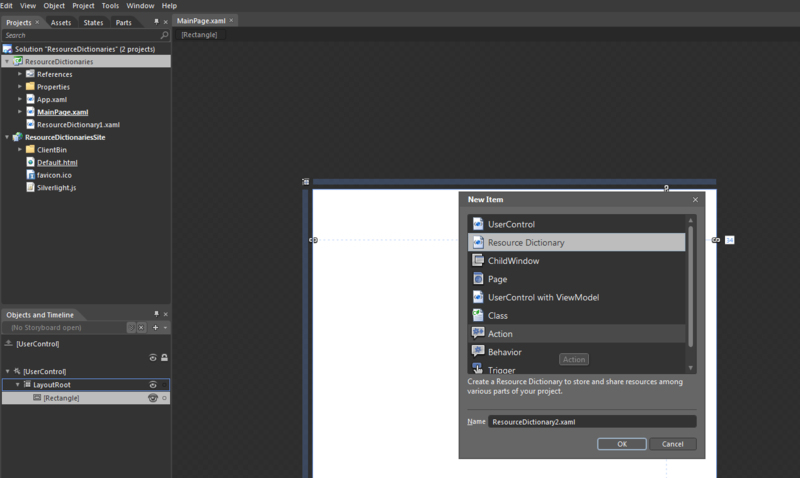 So whenever a Silverlight application is displayed in a browser then the first thing that a browser does instantiates the Root UserControl of the start page of the Silverlight application. 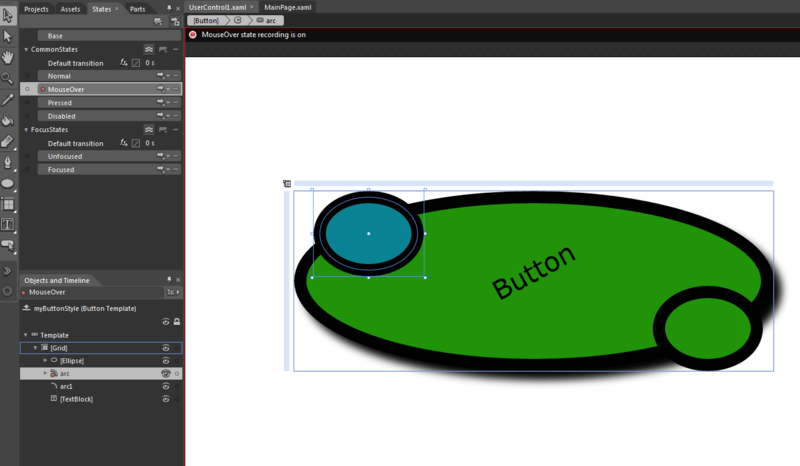 A User Control can have any number of layout containers in it, it has its own code behind and has an entire system that builds an application. 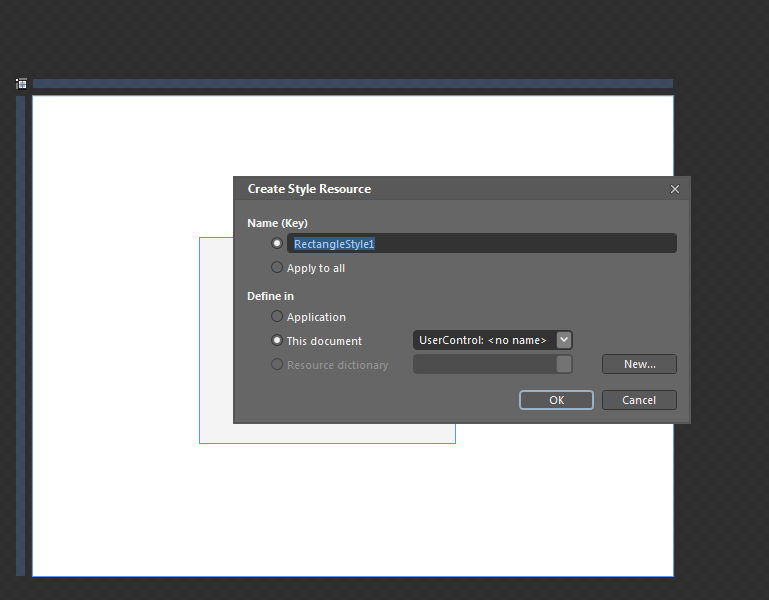 This is concept is extended by Silverlight by moving the pieces of the user control and moving them to the individual documents. 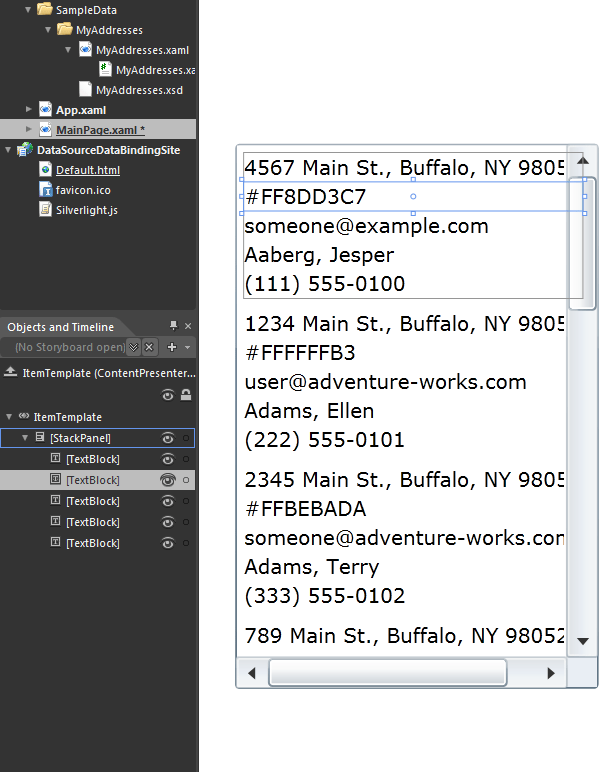 Create a new Silverlight application Expression Blend. 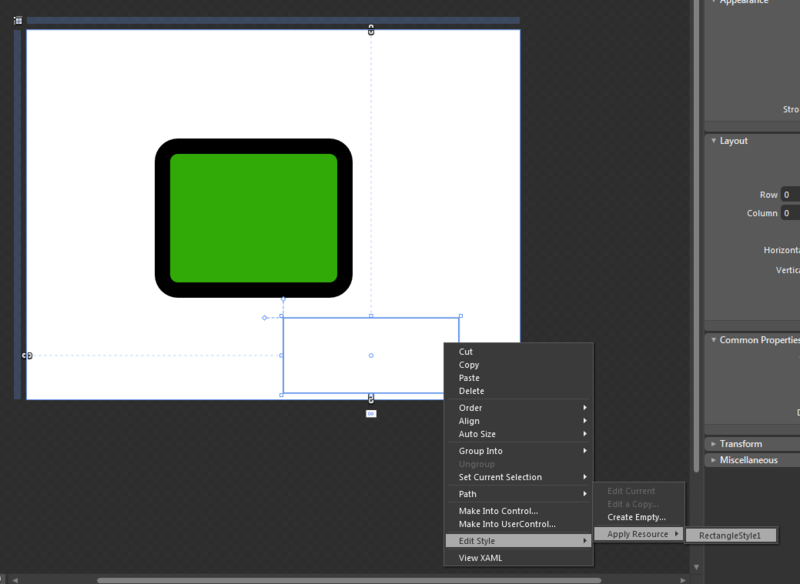 In the UserControl add 4 girds and in each grid add a rectangle and give that rectangle a different fill from the others. 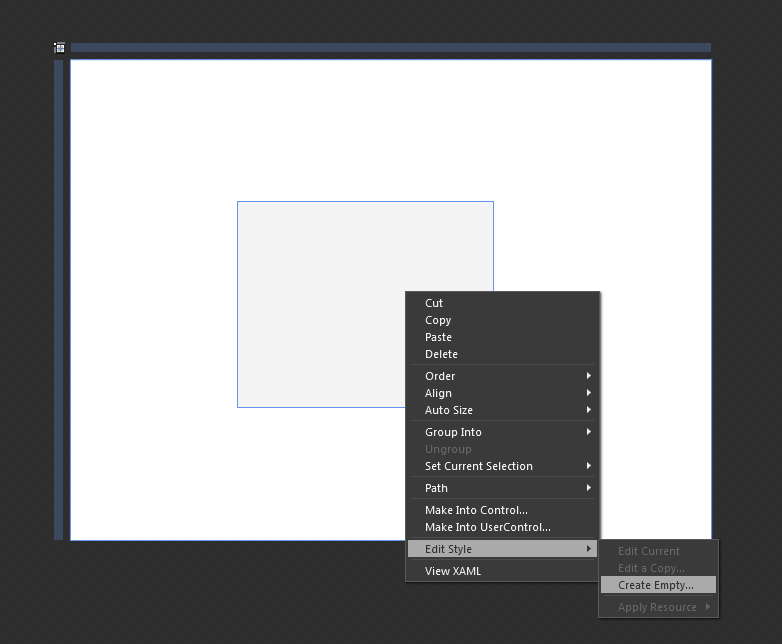 Now right click on the 1st grid and select Make Into User Control. Build the solution. 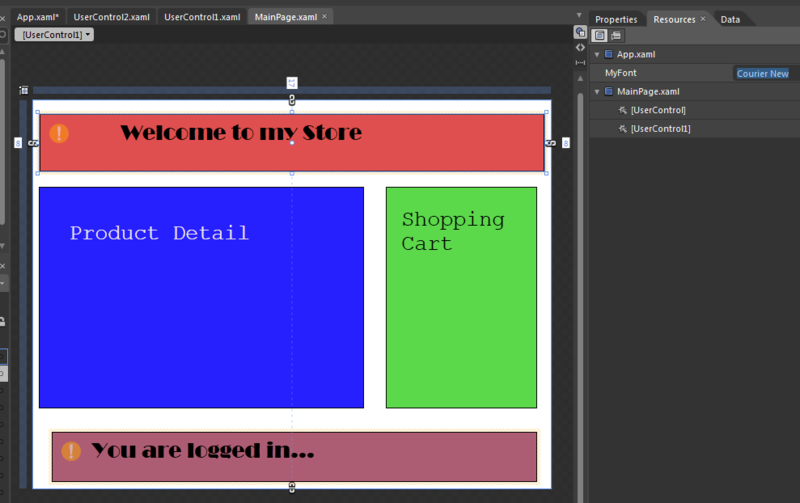 We will see that the our application MainPage is still the samebut if we see the Objects and timeline the grid that we converted to User Control is replaced the UserControl. Also we will see and exclamation mark. Once we build our project it goes away. Now if we go and change something in the user control we will see that the change is appearing in the MainPage but with and exclamation mark stating that something has changed. But you may need to pay attention when you are working with resources and user Controls. Let me tell you what exactly I am talking about. 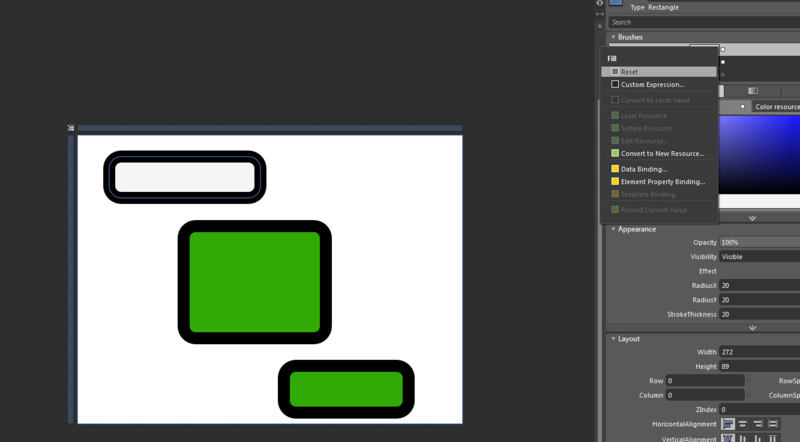 Just Select a TextBlock and drag it onto the Blue Rectangle. Type some text into the textblock. Come out of the edit mode by pressing ctrl + Enter. 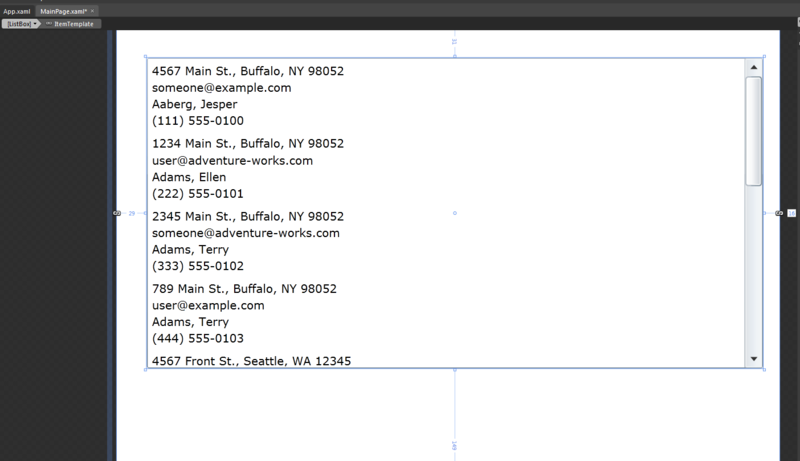 Now scroll down to the Text properties of the TextBlock and select the Font as Broadway and Font Size as 20 pt. 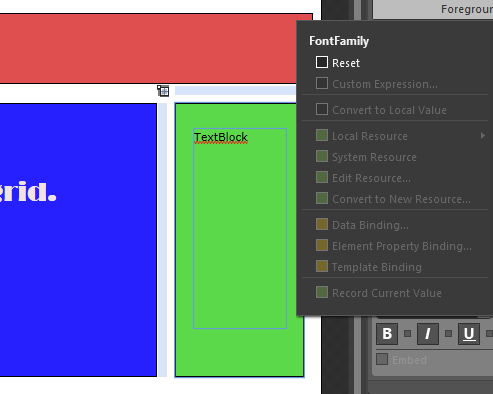 Now click on the property marker next to the Font Family and select Convert to new resource. Name it as MyFont. 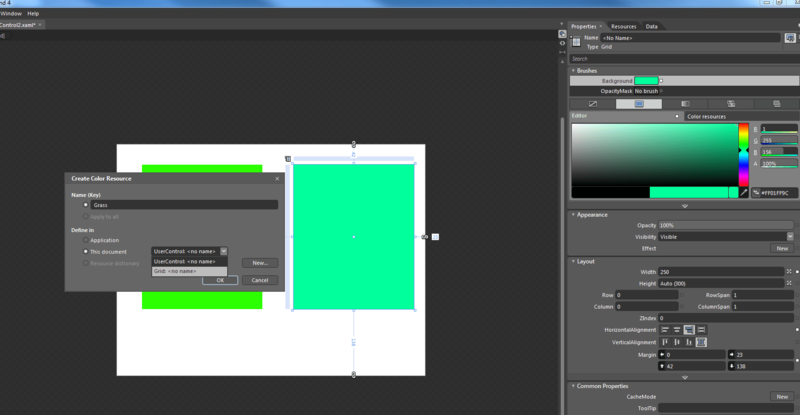 Now let’s go ahead and create another text block in the Green user Control. 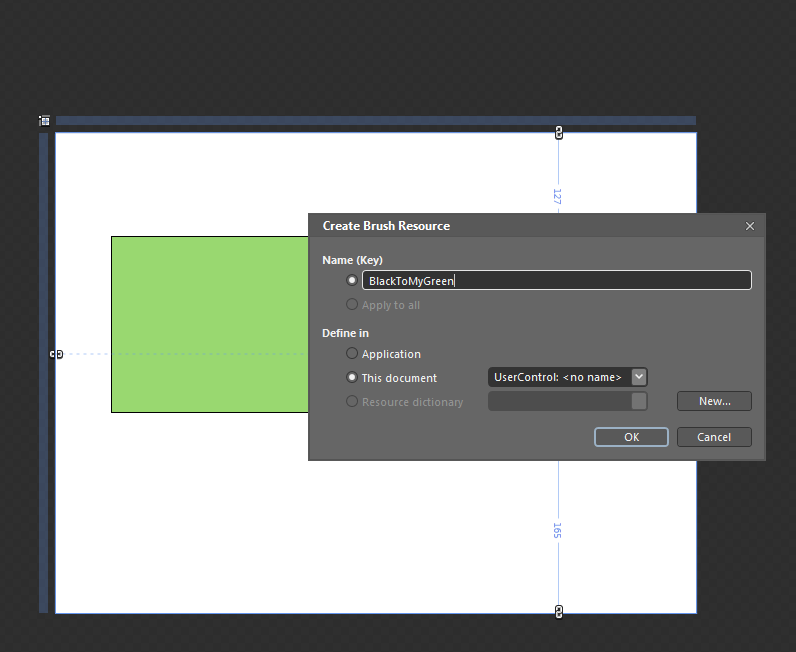 Now try to use the local resources while the text of the textblock is selected. We will notice that while we are in edit mode we cannot create or use resources. 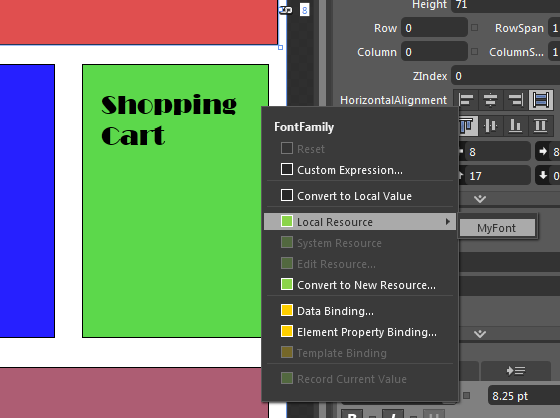 Now let come out of the edit mode and select the local resource MyFont to set the font of the Shopping Cart. 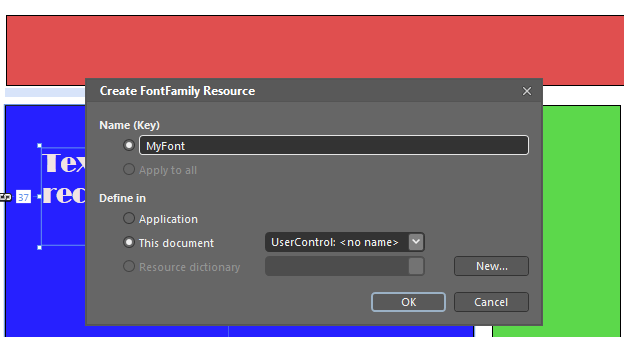 If we place a textblock on the user control and try to use local Resource MyFont than it is not available because we have saved that MyFont as the local resource in the MainPage document. 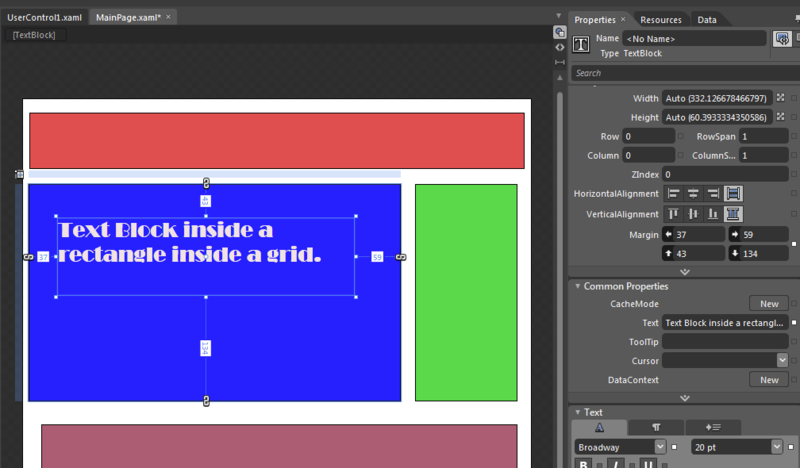 Now lets add another text block to the bottom grid and use the local Resource MyFont. 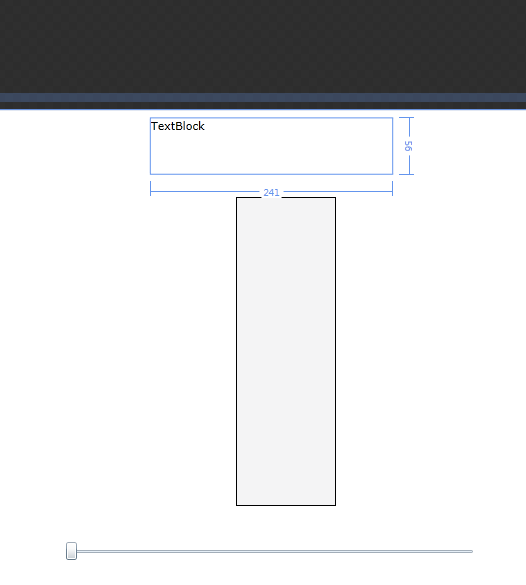 Now let’s make the bottom grid into a user control and now we will see that the Textblock still is using the MyFont resource. 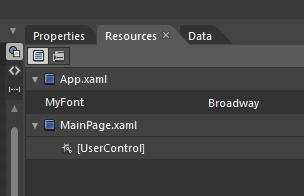 Now lets go to the resources tab and expand the UserControl and we will see that the MyFont Resource is present there. 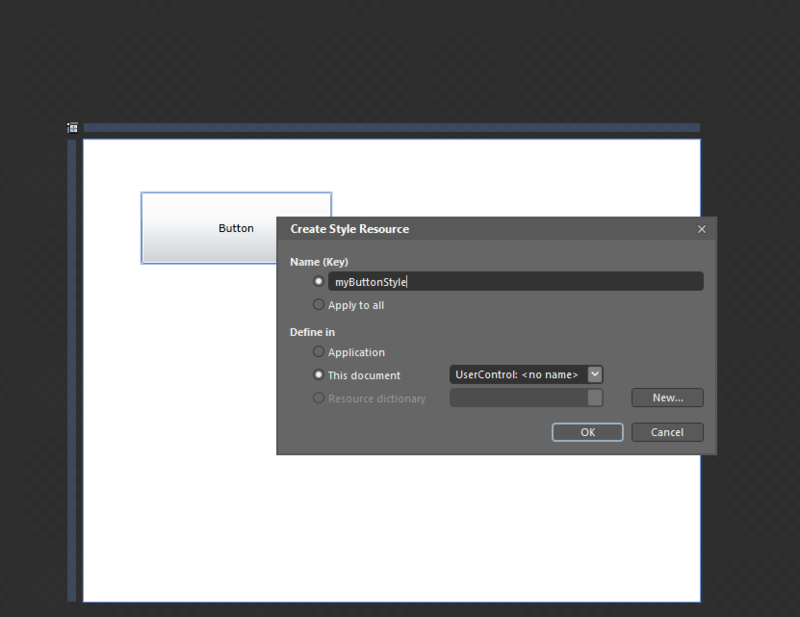 Let’s drag MyFont resource to application level so that all the control can use it. 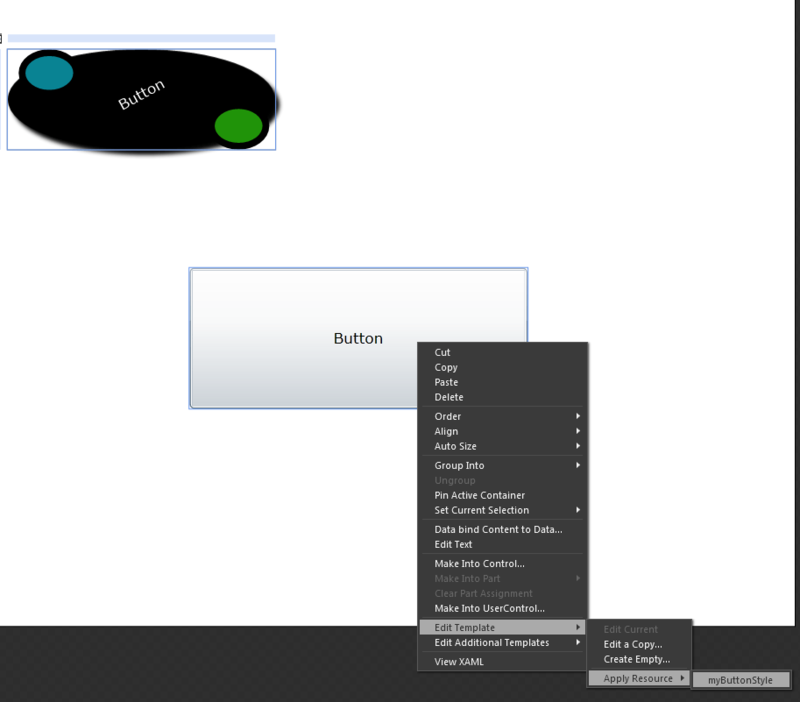 Now if we go to the top user control and use the MyFont resource. Let’s say now we have a requirement of changing the font to some other font. That should be easy right. Go to the Resources tab and change the font to Courier New. You will be surprised to see something like below. This is because the at value change the resources might not be updated. So let’s hit ctrl + Shift + B. Still the bottom control is not refreshing. 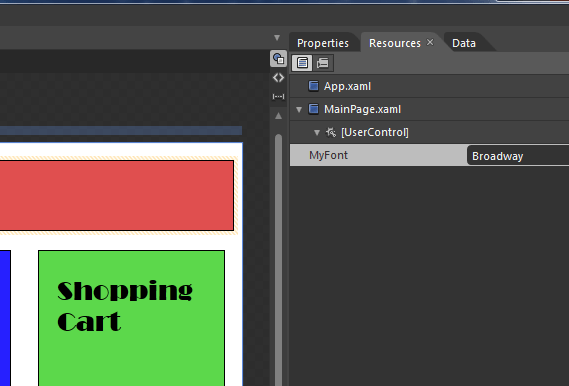 The reason is that when we converted that grid into a User Control it realized that it is referring a resource that it will not have access to when it is converted to a User Control so what it did was created a resource named MyFont in the user Control itself. 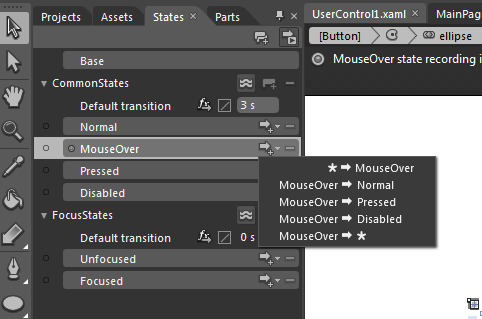 We can see we navigate to the resource of the userControl2. So let’s delete the resource of the UserControl then we will get a message like below. So we will select don’t fix and so the UserControl will still be using the MyFont and will refer the application level resource. Now when you build the application everything should be fine. The code this post can be found here. 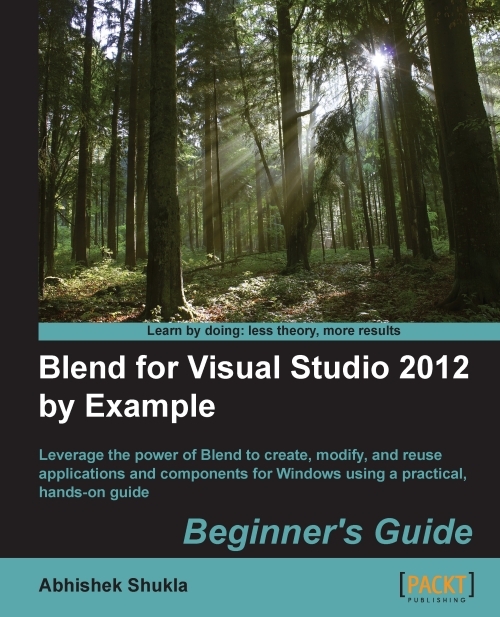 In this section we are going to see how we can use data binding in Expression Blend. We will see how we can create sample data sources and how to use them in data binding. 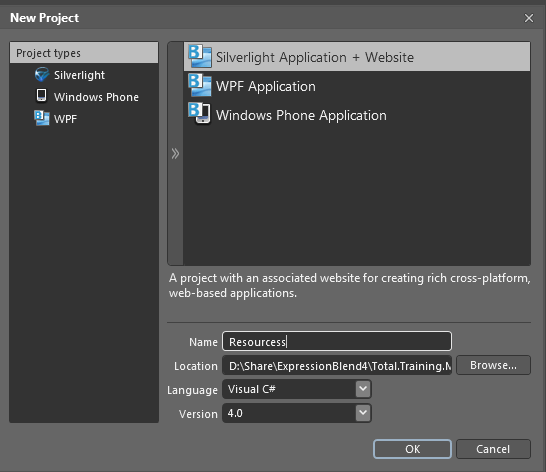 Data binding is a functionality that both Silverlight and WPF have that helps us set the property of an element to an external data source. 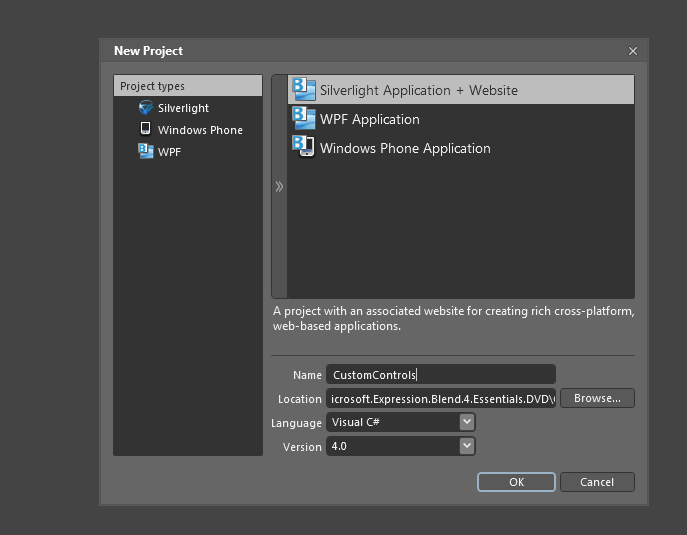 That data source can be xml if we are using WPF and can be any CLR object if we are using Silverlight or WPF. It could also be a sample data source. When we apply data binding to an element then that element does not get its value directly but it has to go to some other location for getting its value. 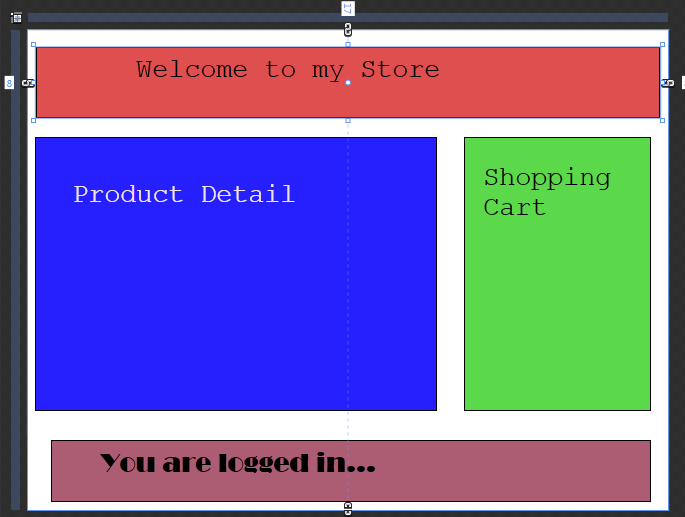 This other location can be another element or a database or an xml. 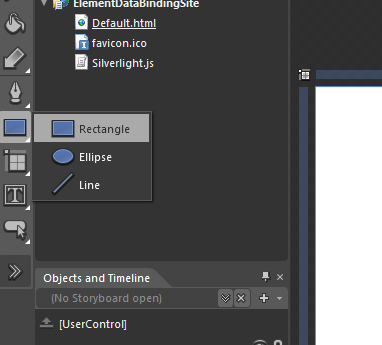 Let’s have a look at the element to element data binding. 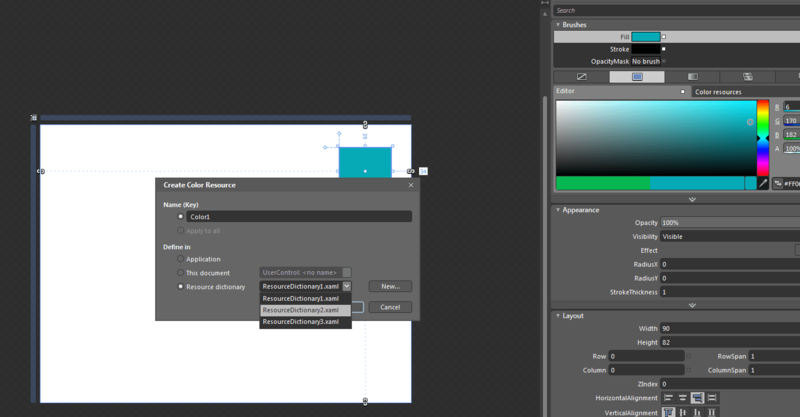 Open Expression blend 4 and create a new Silverlight Project. 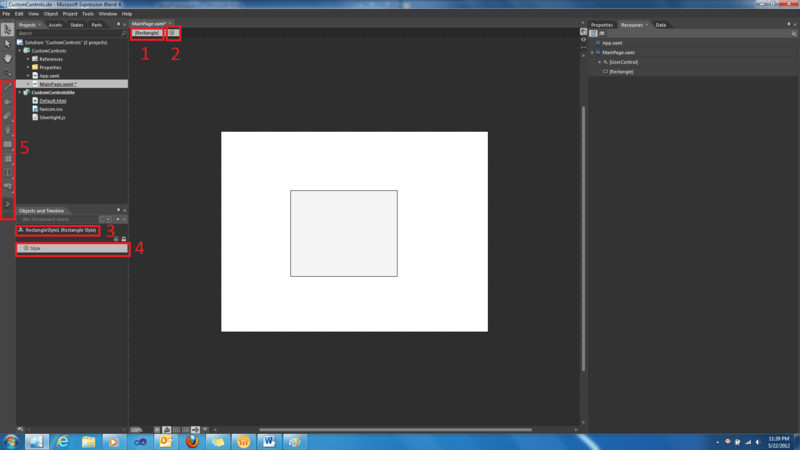 Now go to the tools pallet and select rectangle. 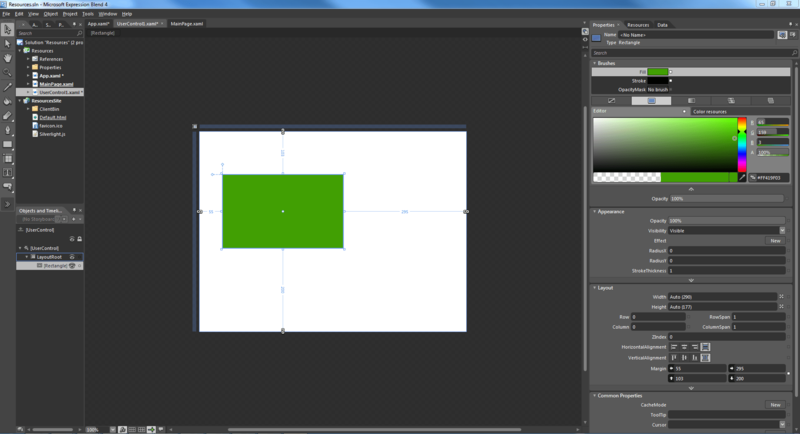 Now create a rectangle by pressing the left button of the mouse and dragging it on the artboard. 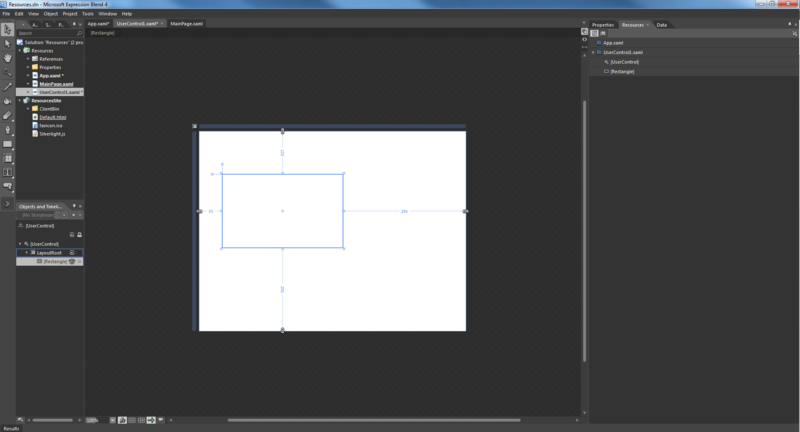 Now go to the properties of the rectangle and set the horizontal alignment to stretch and left and right margins to 0. 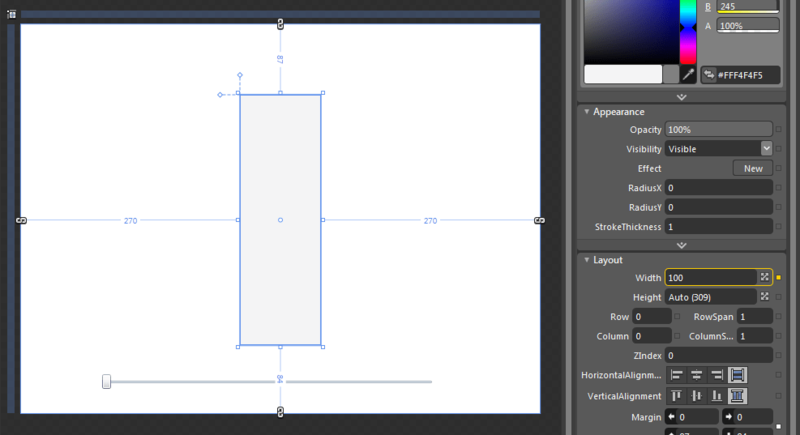 Let’s go back to the tools pane and grab a slider and drop it on the artboard. 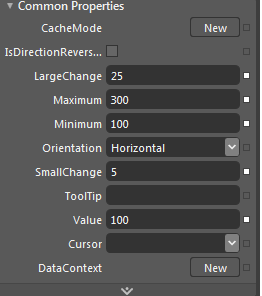 If you have a look at the properties of the slider you would see values like Maximum (The maximum value of the slider), Minimum (the minimum value of a slider), SmallChange (the value that will change when user has focused the slider and uses the up and down arrow key to change the value of the slider), LargeChange (the value that will change when do a mouse click at any location on the slider track). Let’s set these properties as shown below. Now let’s setup the data binding. 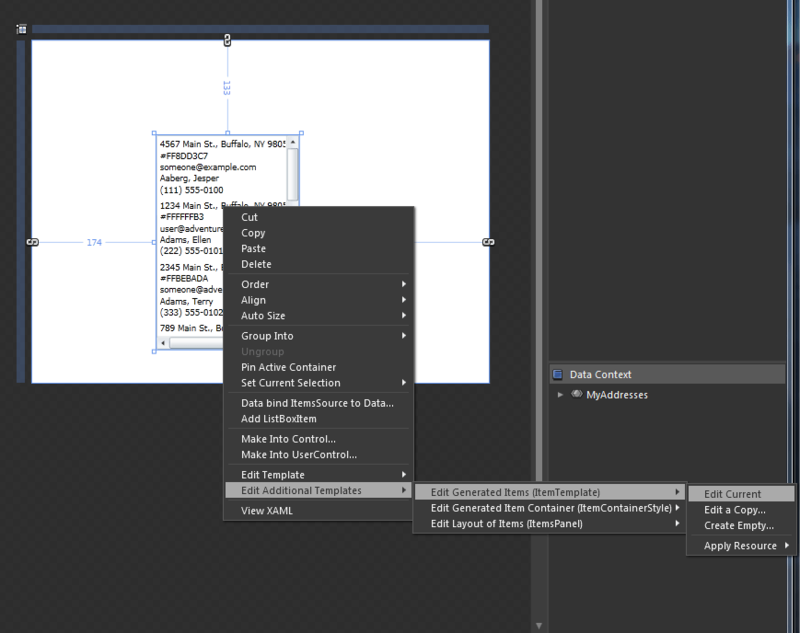 There are two ways to set the data binding: one way or two way. In one way data binding only one property can change the other but not vice versa. 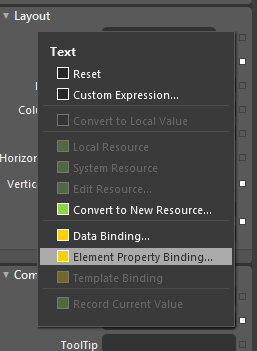 In two way data binding both the properties can change each other. 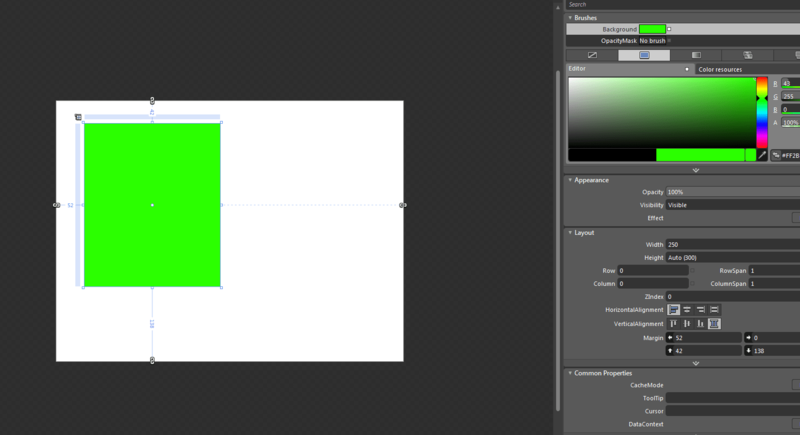 In this case we want only one way binding so that the width of the rectangle can change on the change in the slider. 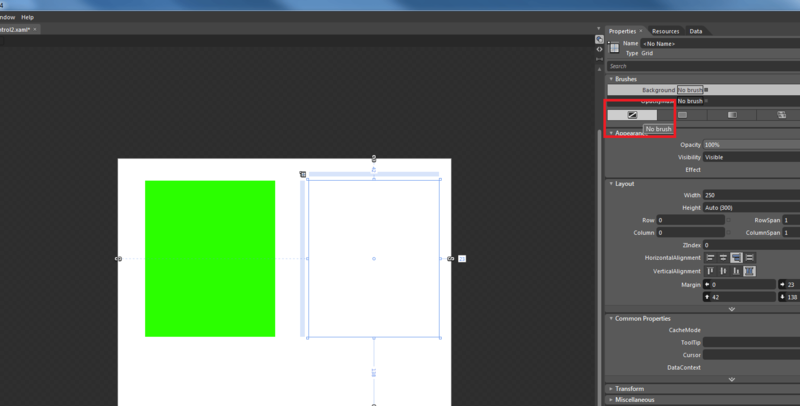 So let’s select the rectangle and go to the width property and click on the property marker next to it. 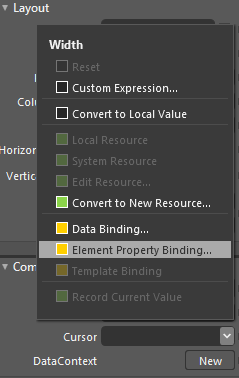 And select element property binding. 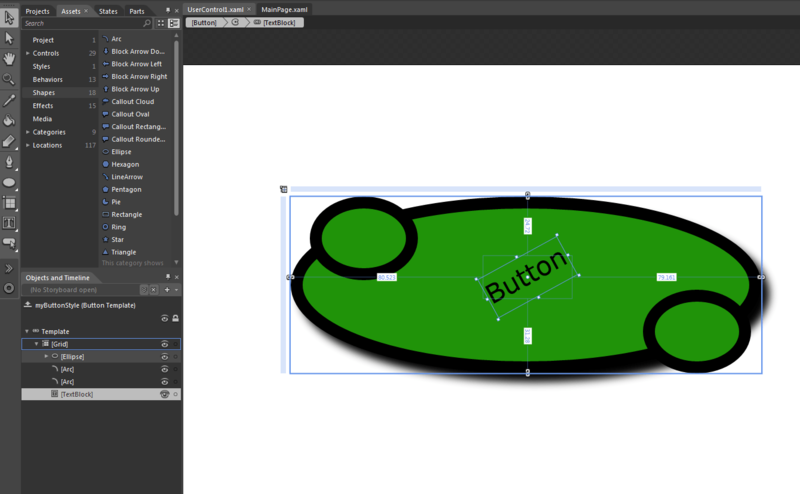 Now our cursor has been moved to the object picker mode so we need to point to the element with which we want to do the property binding. 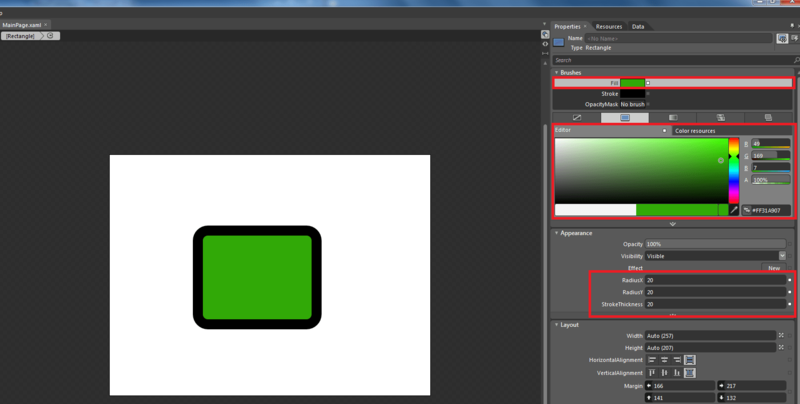 In this case we will move our cursor to the slider and click on the slider. 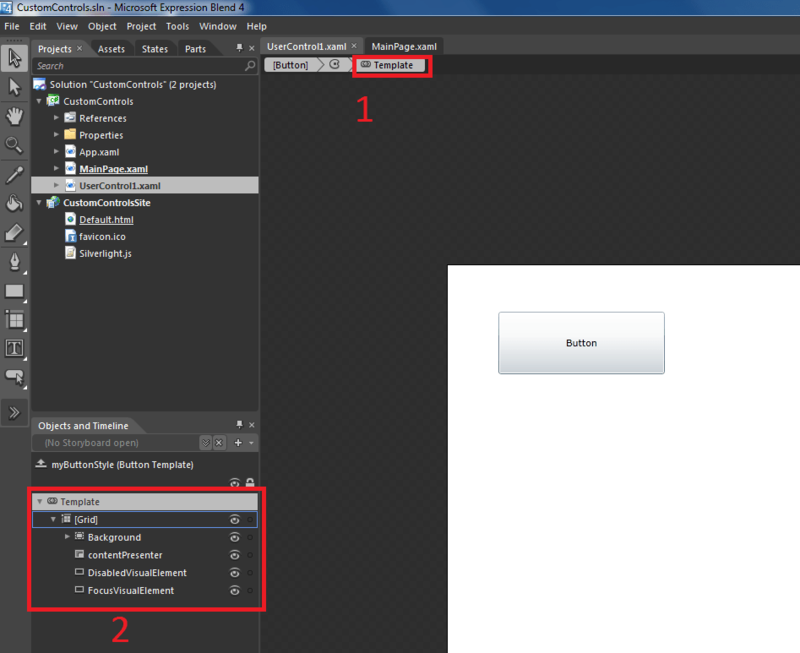 Once we will click on the slider we will get an option select which property of the slider we want to bind to and we will select value. The moment we do this we see that the width of the rectangle is changed and the Width property has a yellow rectangle around it showing that this property is getting its value from some other location. 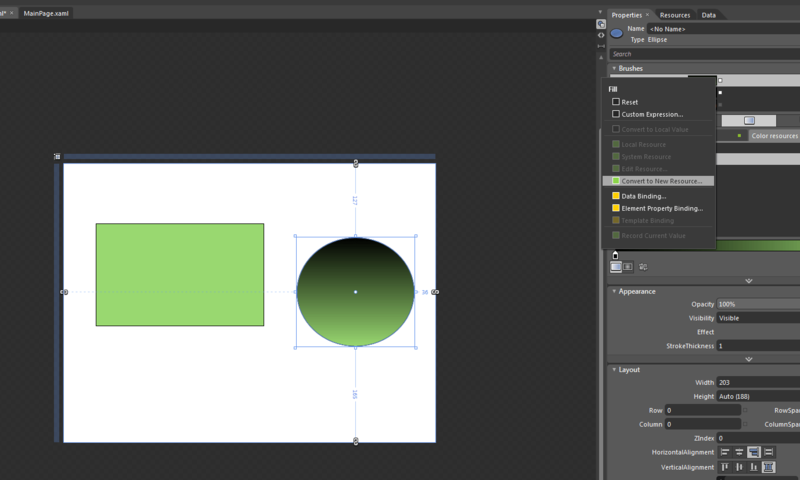 Now we can run the application and see that the width of the rectangle will change as we change the slider value. 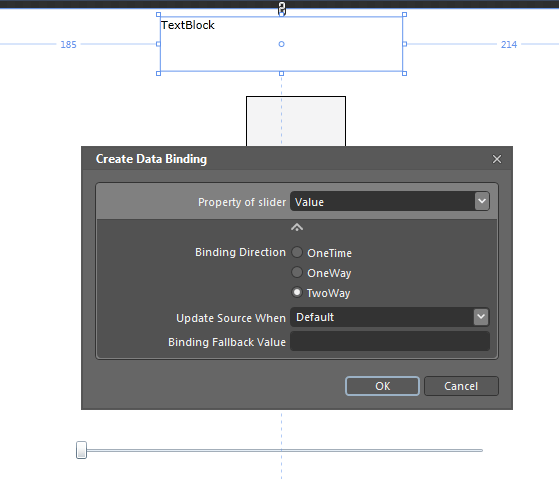 In this section we will see how we can create two way data binding. 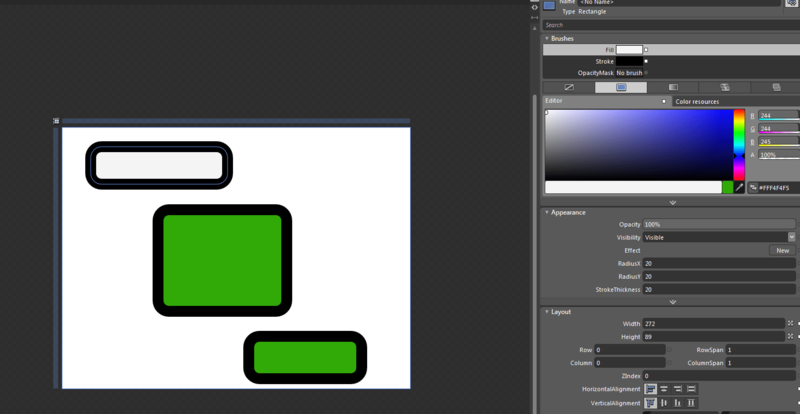 Along with the Slider we will provide a textbox to modify the width of the rectangle. 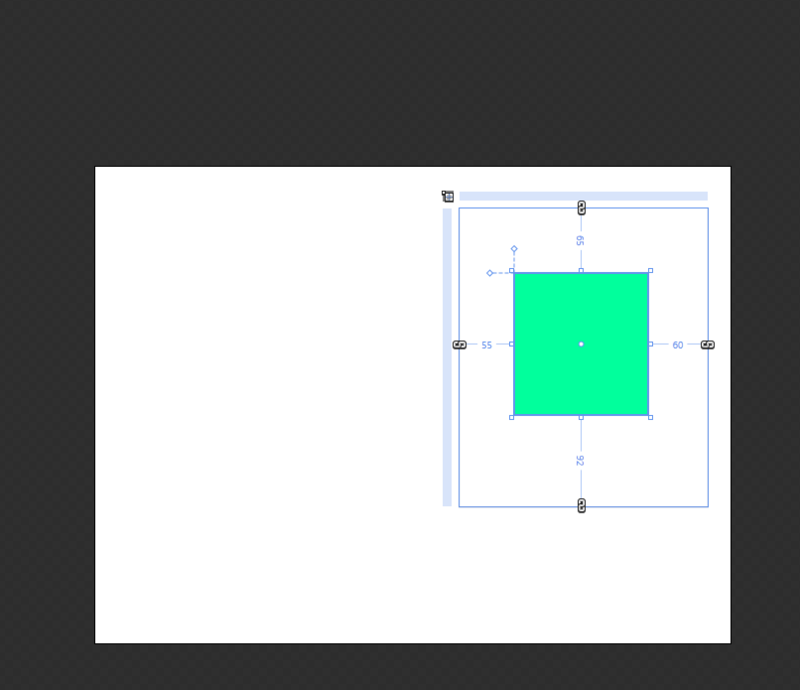 Let’s drag out a textbox on to the artboard. 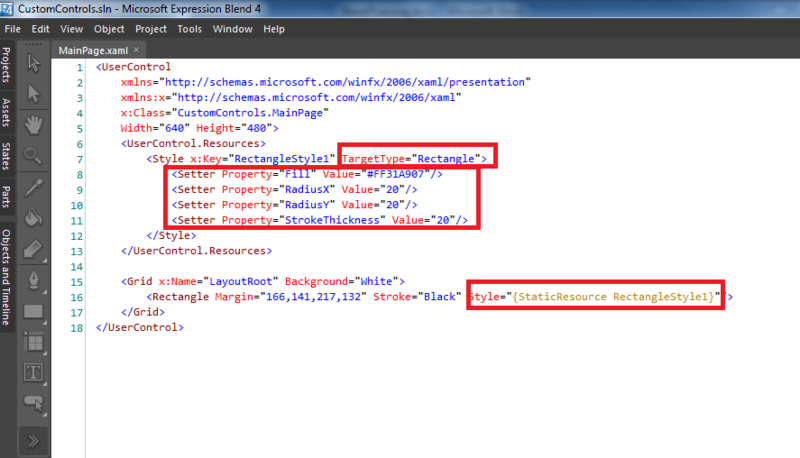 Now go to the text property of the textbox and click on the property marker and select Element Property Binding. 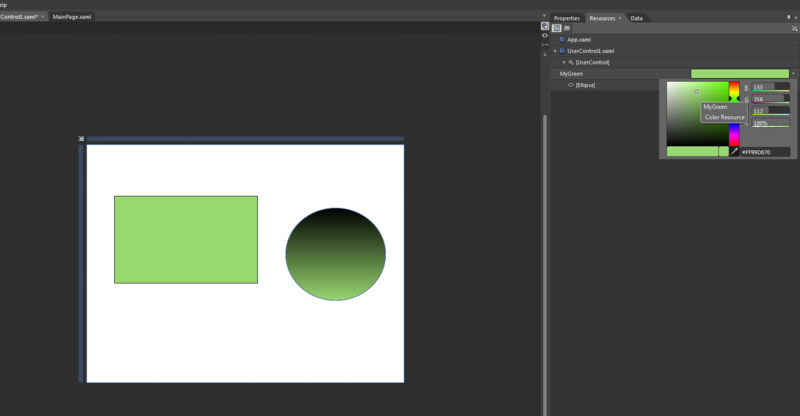 Select the slider control again and select its value property again as we did in the case of the rectangle. 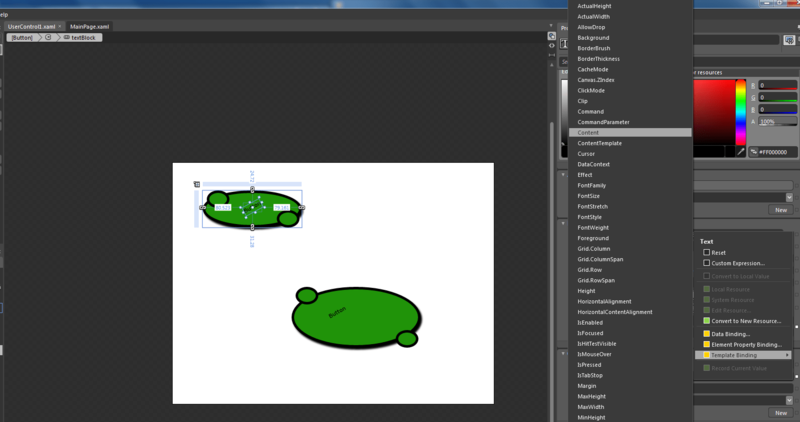 Also we will select the TwoWay Binding so that both the controls i.e. 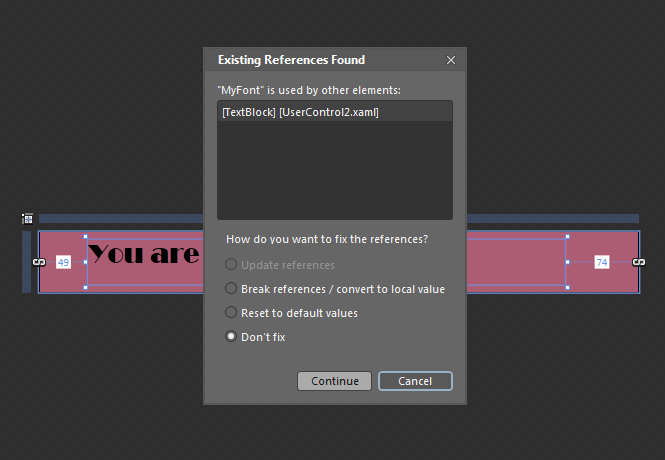 TextBox and Slider can change each other’s value. 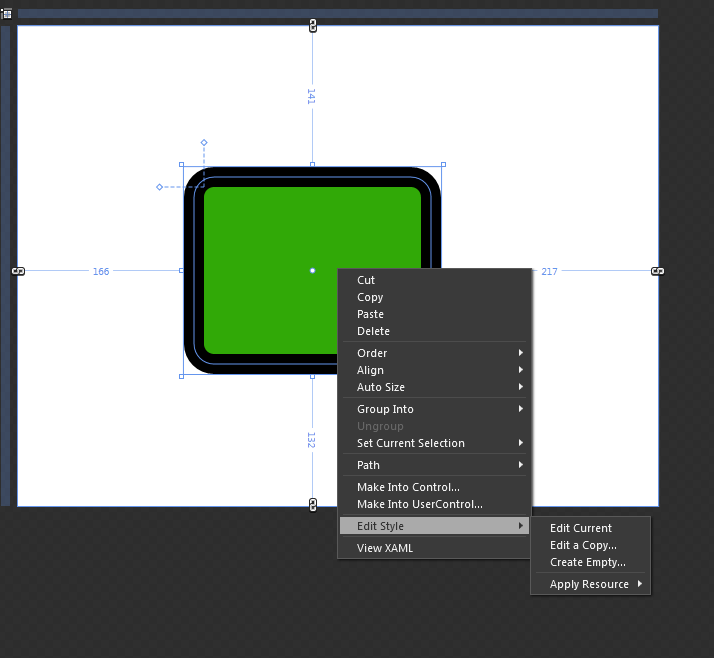 Now we can run the application and change the value of the slider or textbox and we will see that the width of the rectangle is changing and the other control’s value is also updated. 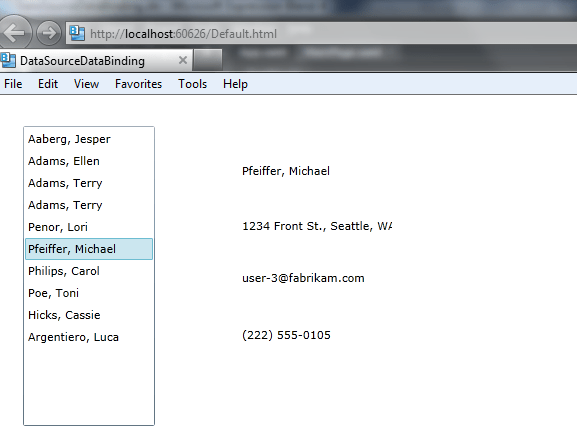 In this section we will see how we can use data binding with data sources. 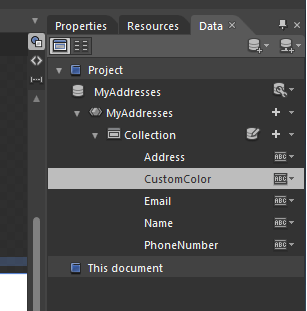 Data sources can either be xml or any other CLR object. 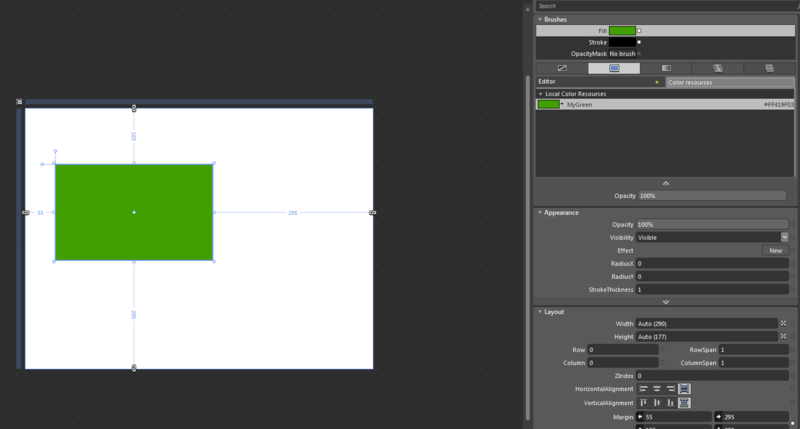 As we know that xml works only with WPF so for this demo we will have to use data binding with sample data. 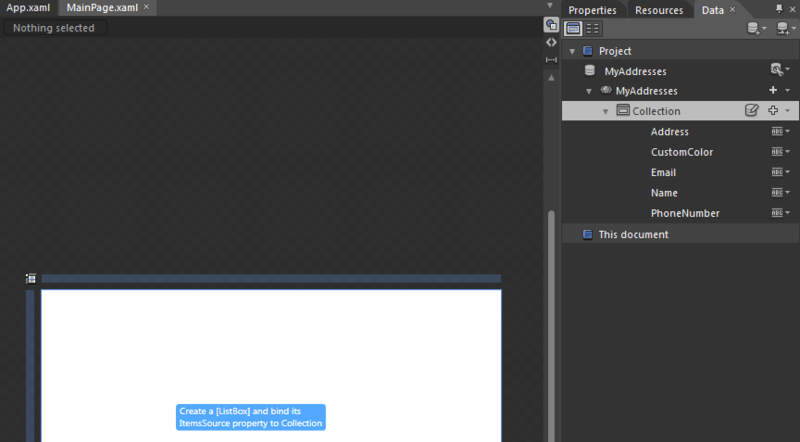 When we work on an actual project we have CLR objects in which data is stored and they definitely follow some schema. 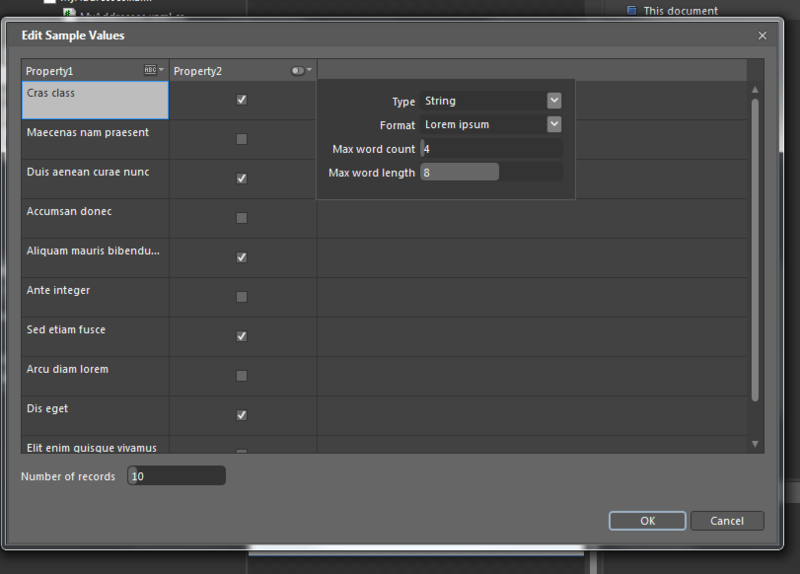 So we can build up sample data in Blend to represent that sample data. So let’s get started. 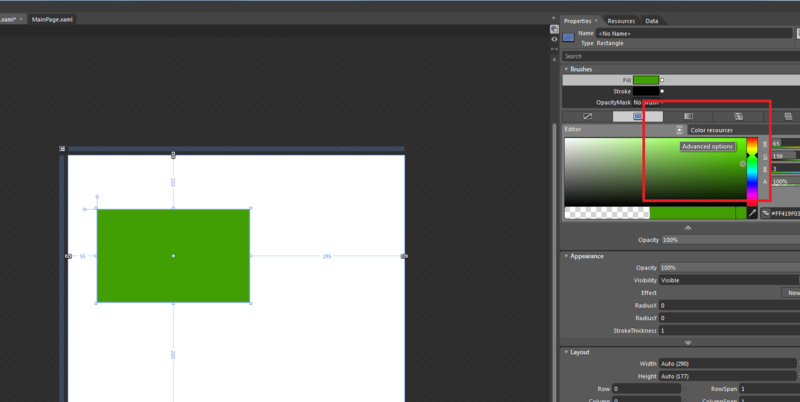 Create a new project in Blend. Navigate to the data tab in the right panel. 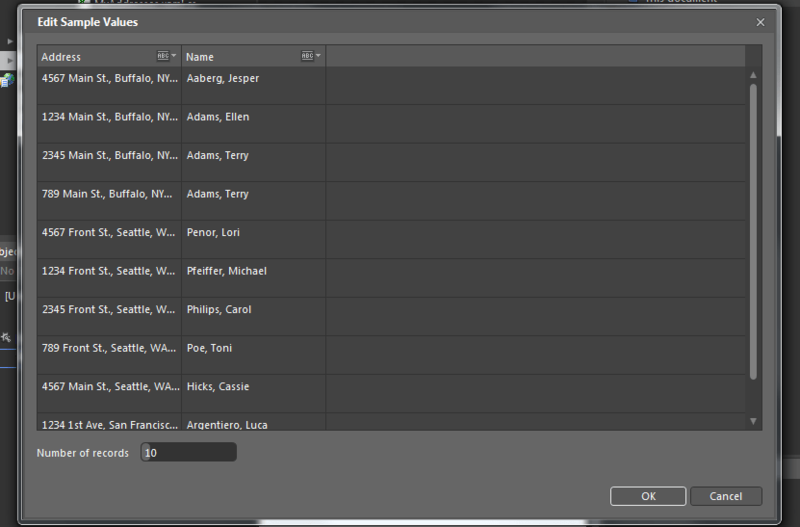 If the data tab is not visible then goto the window menu of blend and select data. 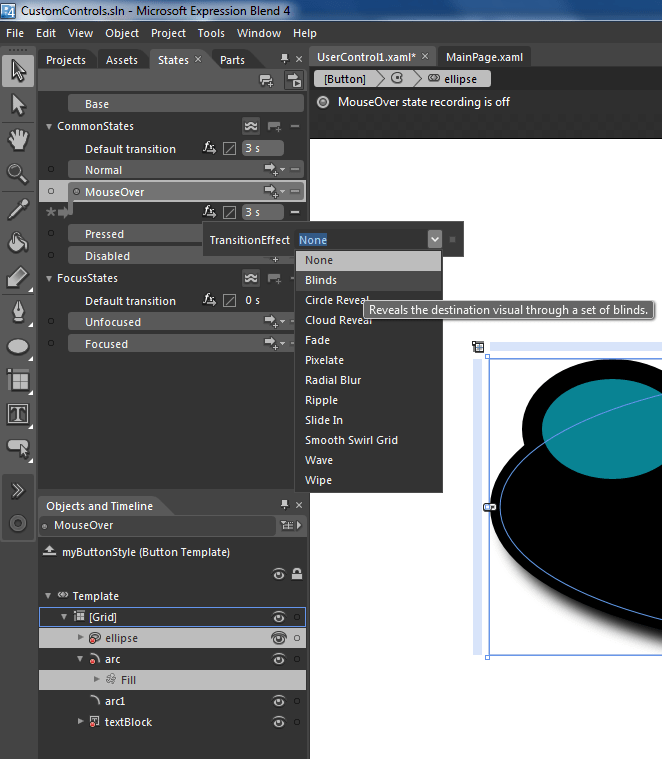 Click on the Create Data Source. And select New Sample Data. 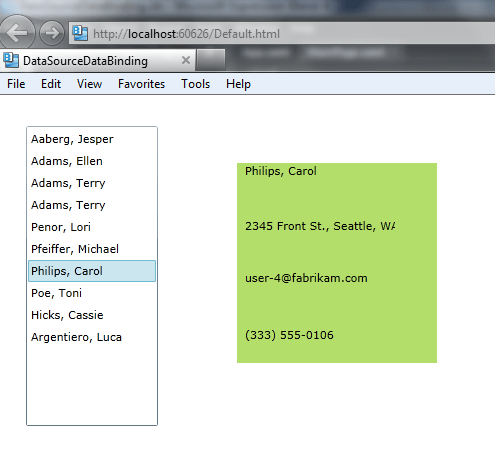 You will also see option to create Sample data using XML or Class. If we have those then we can use them. 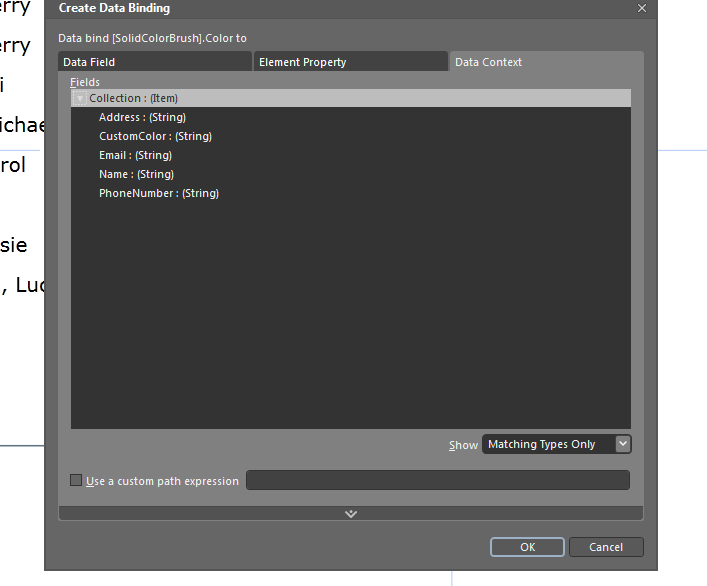 When we select any of those two options then blend will not exactly use those but take them as a basis for generating sample data. 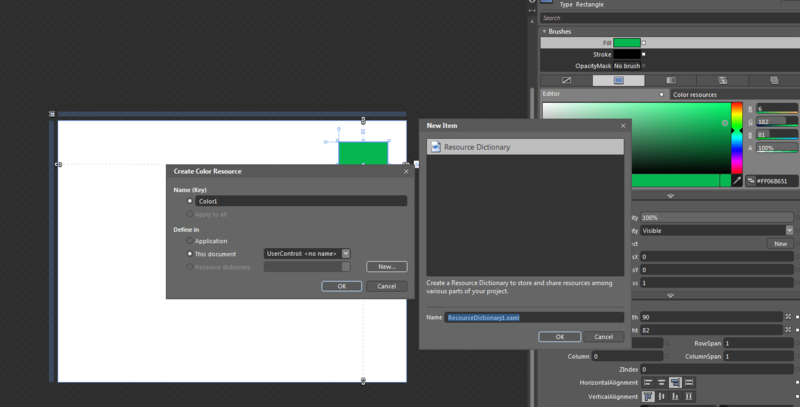 Give the Sample Data Source some name and select the define in as project. 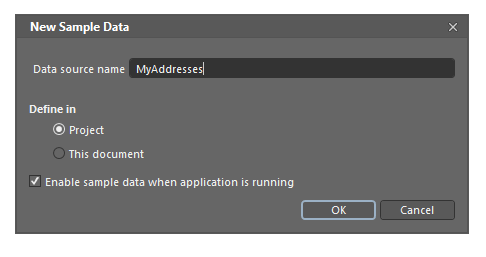 We do want to enable sample data when application is running so keep It checked. 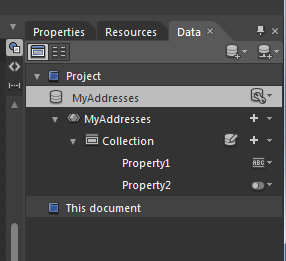 When we click ok we will see that the data source appears in the data tab at project level and we have a collection with properties in it. 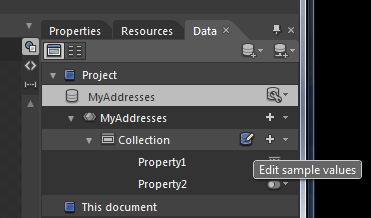 We can also see that in the Projects that a new folder is added named SampleData. 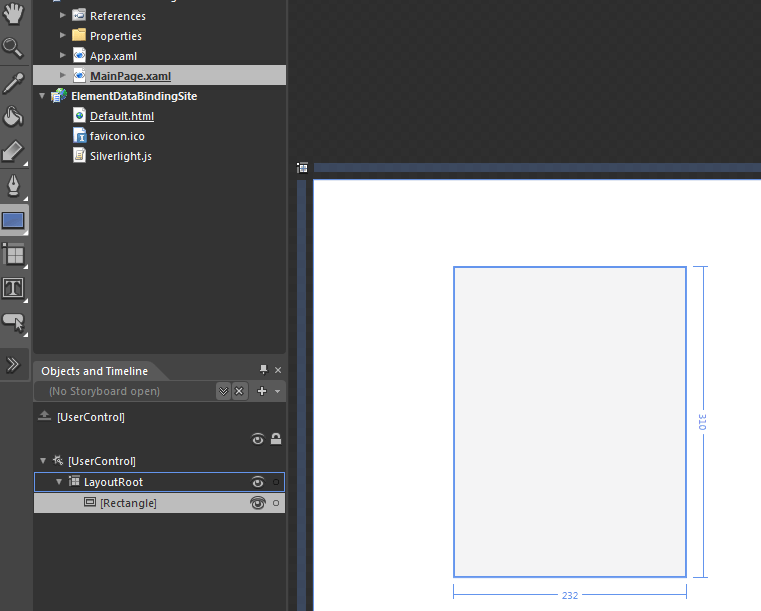 When we expand it we see that there is a xaml in it which will store all the data and an xsd which is the schema. 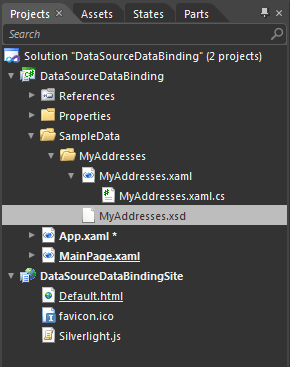 If we open the MyAddresses.xaml, we will see that we have some items already added in the data source. We modify their values or add new items. 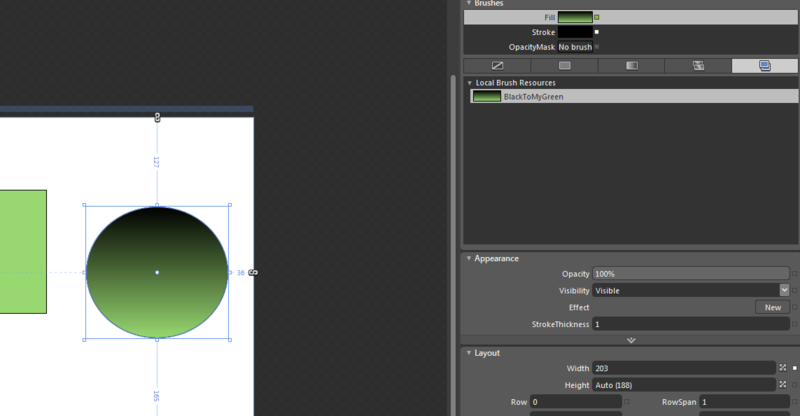 Let’s go back to the data tab and click on Edit Sample Values as shown in the image below. We will see something like below. 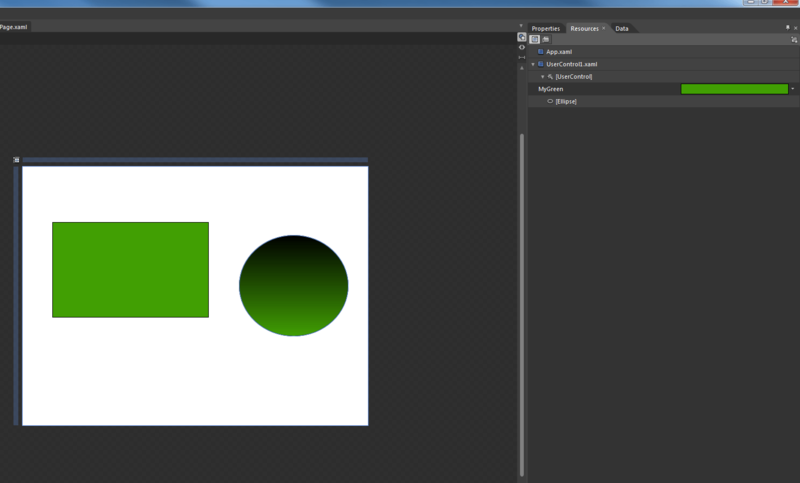 We can edit the values or the types of these properties. Let’s rename the properties as shown below. 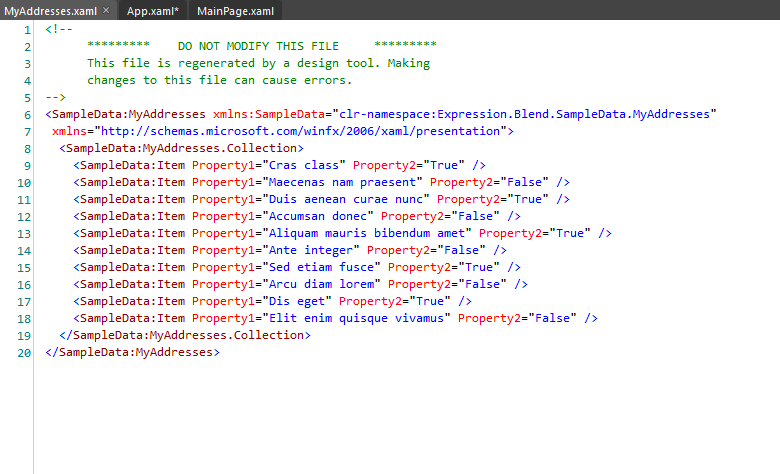 Also lets change the specification of the Address property as shown below. Also similarly change the Format of name to Name. When we do that if you go back to Edit Values we will see that the data is has been populated according to the format selected. And we will see data something like below. Now let’s start using this data that we have created. 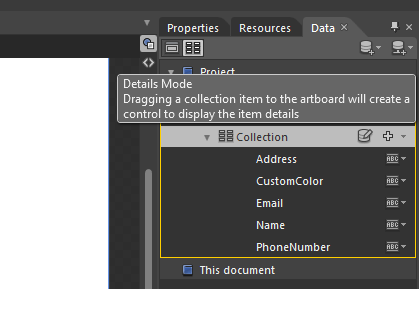 Drag and drop the Collection onto the artboard. And a listbox will be automatically created. And each entry will show all the fields. 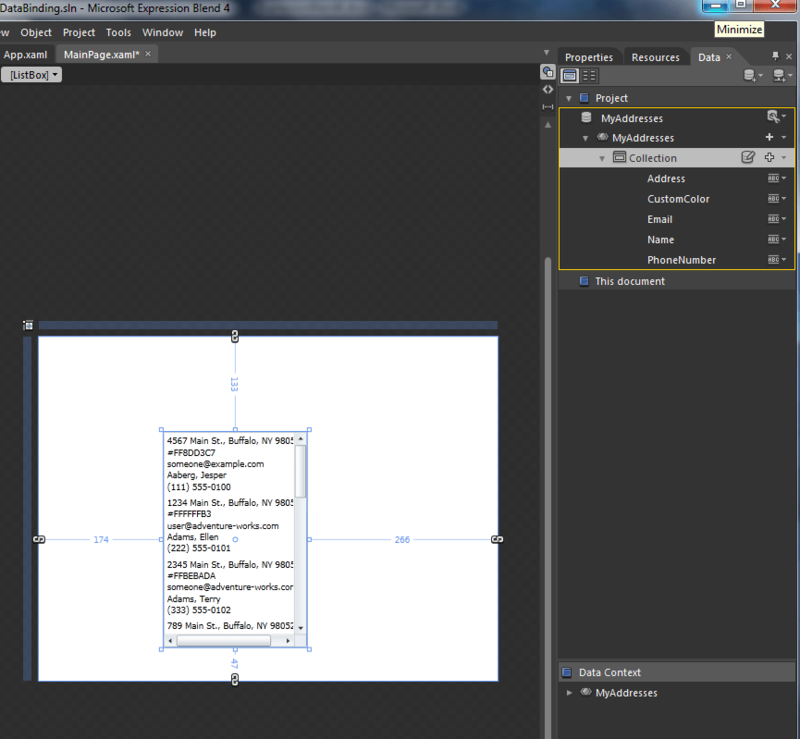 Also the yellow rectangle around the datasource shows data binding. We would something like this. 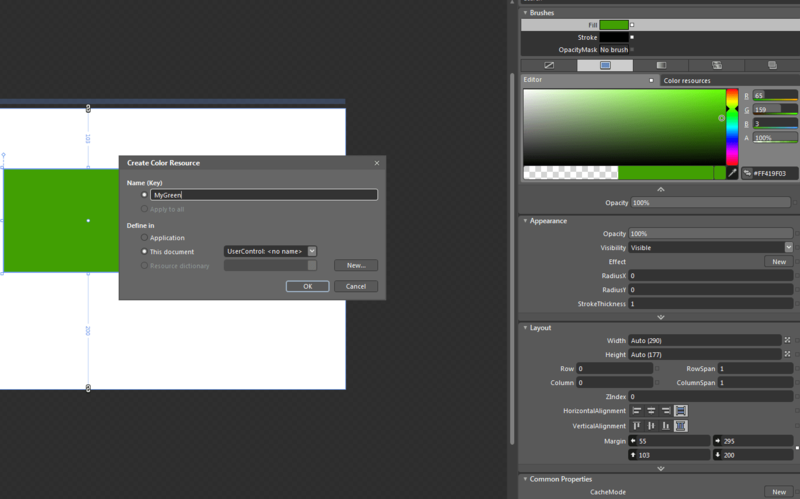 Let’s delete the Color textblock as we do not want to display the color in this way. 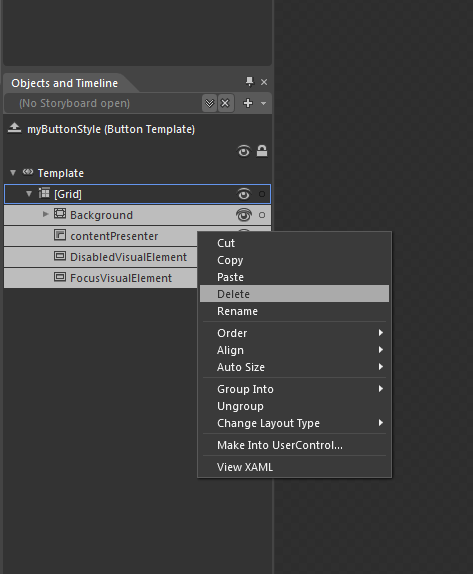 When we delete that textblock you would see that that textblock is deleted from each item and that’s the way templates work. 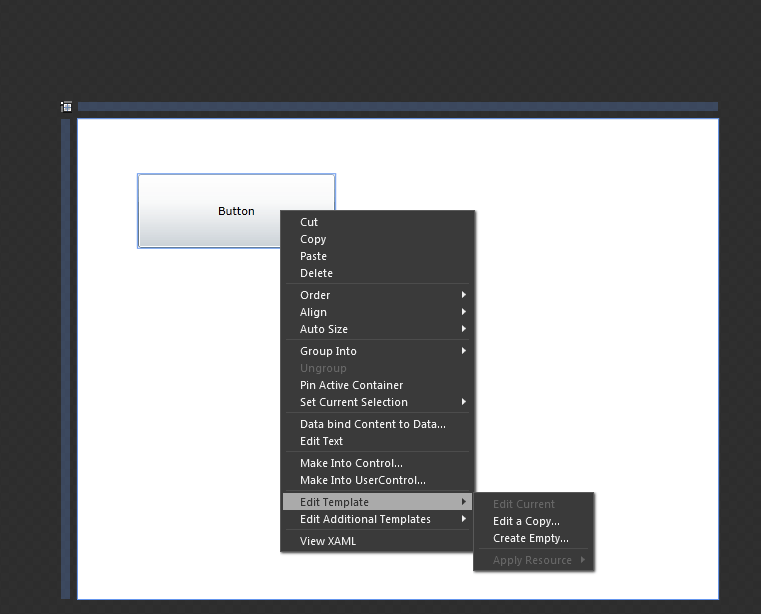 Now let’s select the listbox from the breadcrumb bar and stretch it. 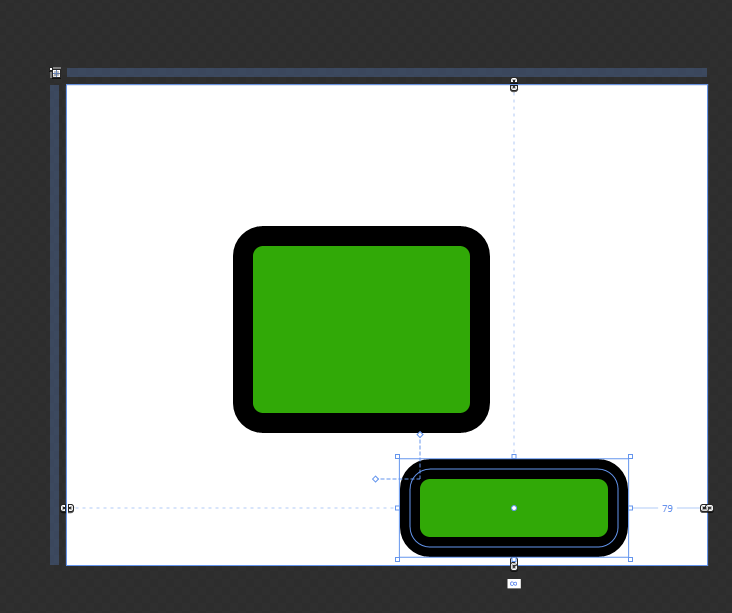 Now let’s go back to the template and change the orientation of the stackpanel to horizontal from vertical. And then build the solution. We will see something like below. 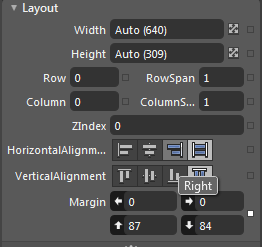 Lets give specific width to all the textblocks and we will see a clean layout. Let’s delete all the textblocks except the Name TextBlock. 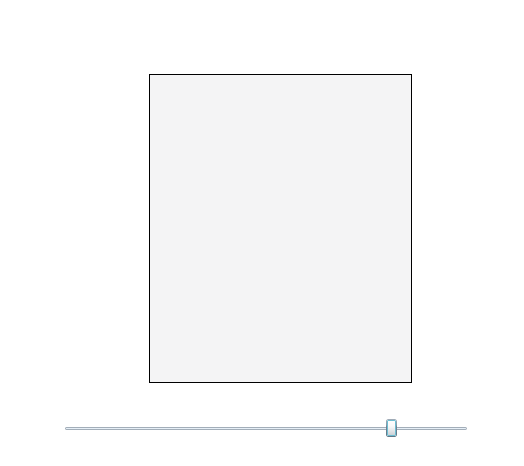 Then let’s go back and select the listbox and reduce its width. 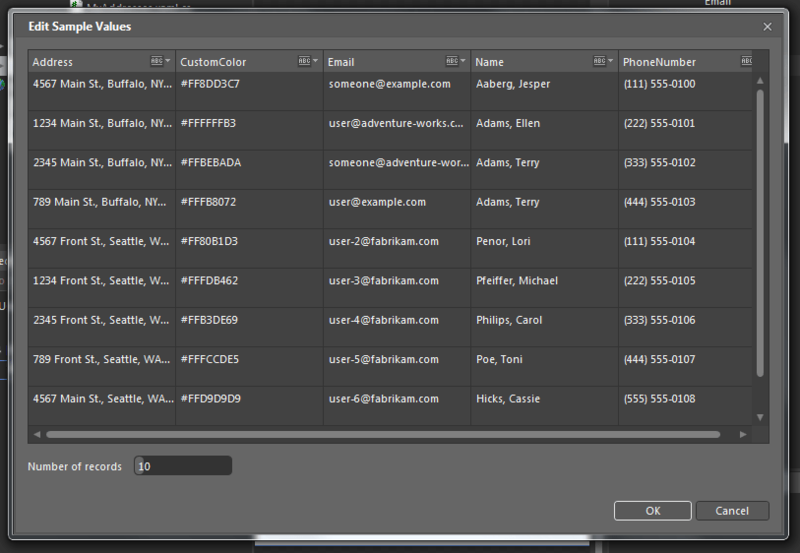 Now go to the data tab and select the view mode to details view. 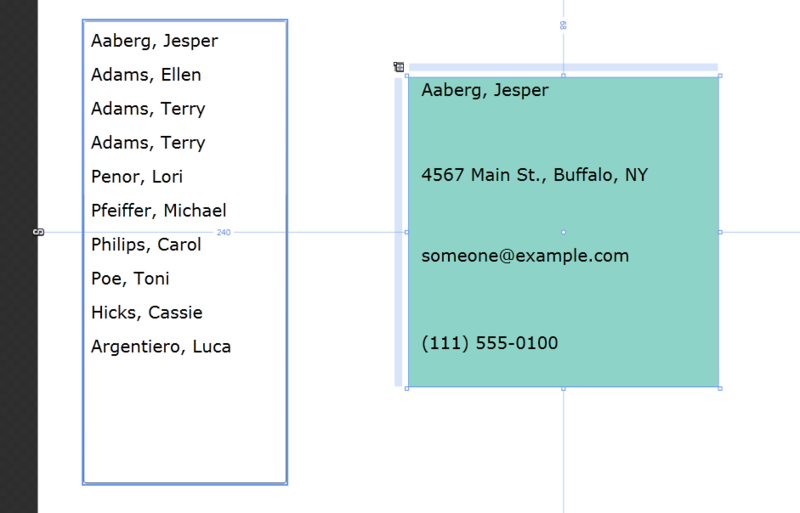 Now let’s drag the Name field on to the art board. 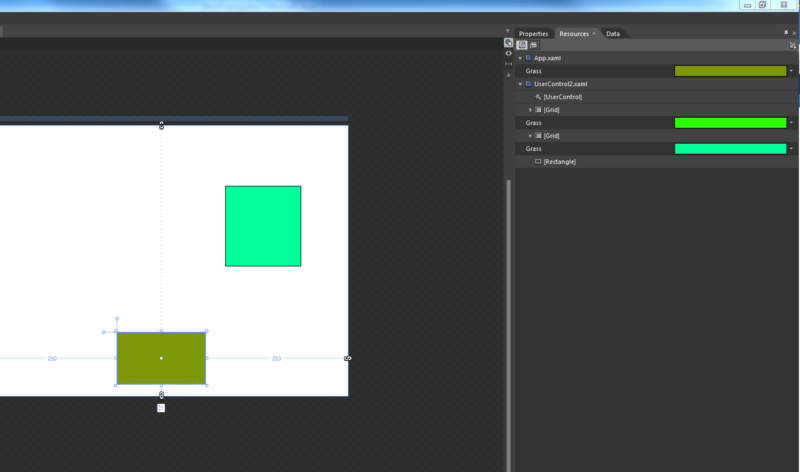 We will see that a grid is created along with textblock as its child. 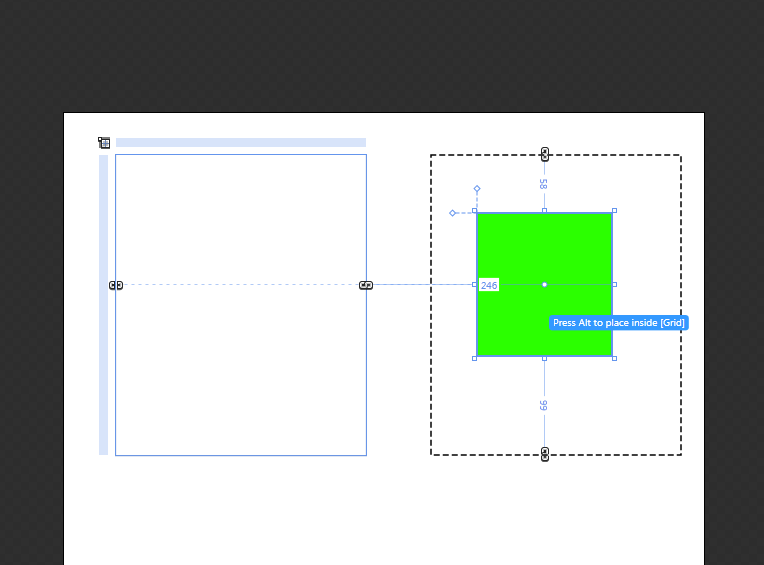 Now whenever we select the item in the listbox we will see that the content of the textblock in the grid is changing. This happens because the grid that got created has a concept called Data Context. 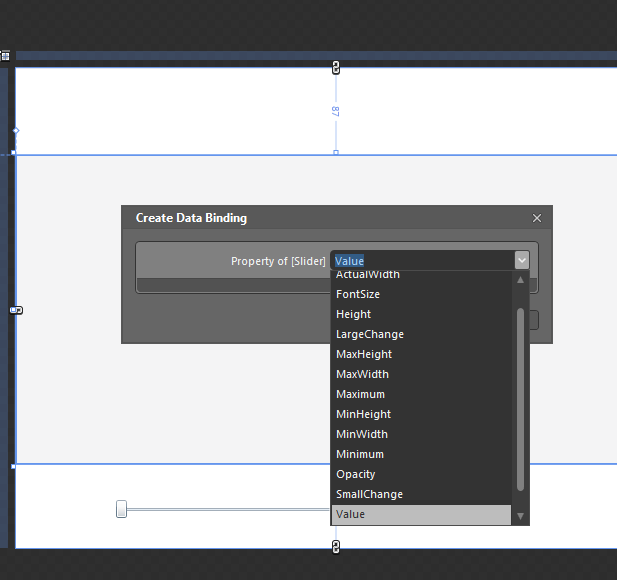 The grid has its data context set to the list box. 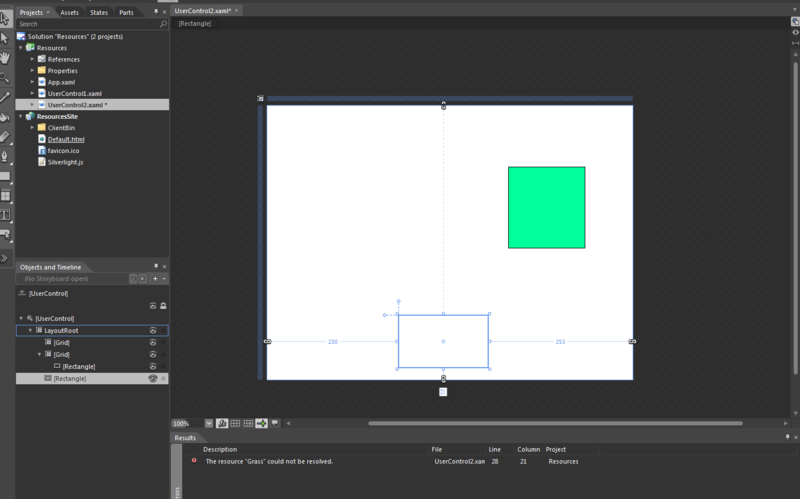 So as soon as an item is selected in listbox then the the value changes in the grid as the items in the grid have already specified what item of the listbox they want to display. We can other fields as well in the grid and see that their value change as the selection of the listbox changed. When we run the application we will see something like below. Lets go to the grid à Background à Property marker à Data Binding. We will a window like below. 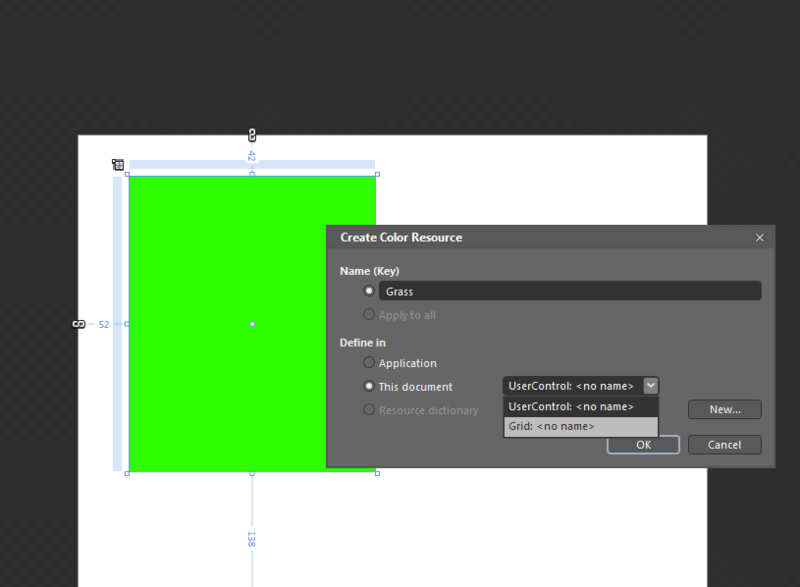 Select Customcolor string and the background of the grid is bound to the color string of the selected item. The value conversion is going on in the background. When we run the application we see something like below. Any questions, comments or feedback are welcome.